Pro-100 Auto turn on Wi-Fi? 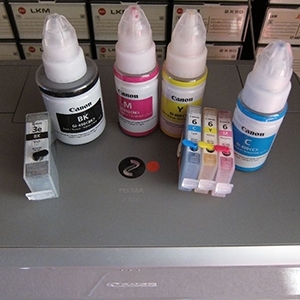 Discussion in 'Canon InkJet Printers' started by Picard, Nov 3, 2018. Does anyone know if this Canon printer will automatically power up via a received print task over WiFi? It’s possible with the Pro-10s. You have to activate “auto-start” in one of the maintenance tabs of the driver ( it’s disabled by default) and the machine has to be “ON” when you enable this feature because those settings are stored in the memory of the printer. My guess is that the Pro100 will behave likewise, both models being similar in many aspects, but only Pro-100 owners can tell for sure..
Picard and The Hat like this. Thanks much. I had a ip3000 which was auto power which is how I used it. Never had to power it on (or off). Just send it a print job via usb and it would power up and do it's thing. I was pretty sure the100 would do the same, but since it also has wifi (ip3000 did not) that it would alsoauto power up when sent a wifi print request. Probably not though. Search Google for "Pro 100 manual" then do a search in the PDF manual for "power" or "auto power" and viola. Online manuals are usually simple to find and may provide answers to simple questions quickly.